That sound you hear is (meat)heads exploding around the world. You probably know Quest Nutrition from their market-leading Quest Bars (Chocolate Chip Cookie Dough is basically the bestselling protein bar of all time). But in the last few years, Quest has become more than just a protein bar brand – they released a line of Protein Chips and Protein Powders that the fitness community is rapidly become obsessed with… but no one saw this next product coming. Quest just released Protein Spray Tan. It’s composed of dermatologically-absorbable amino acids dissolved into an oil-based substrate… plus pigment. Translation: it’s protein pieces broken down into small enough components that they can be absorbed through your pores. It will also tint your skin. According to Quest, the pigmentation effect lasts anywhere from 1-4 weeks depending on pore size, skin-oil level, and how well you follow the application instructions (skin must be clean and dry before spraying). The new line of tanning products comes in three different “flavors” depending on how dark you want your tan to be: salted caramel (they also have a popular salted caramel protein powder), creamy mocha, and dark chocolate. Presumably, the tanning product is also edible and tastes like those flavors. Ron Penna, Quest’s CEO and the head of its R&D department had the following to say about his newest incredible edible, “"It’s the perfect blend of nutrition and presentation. Since there’s already so much going into contest prep, you’re killing two birds with one serving. Lick it off for faster absorption. 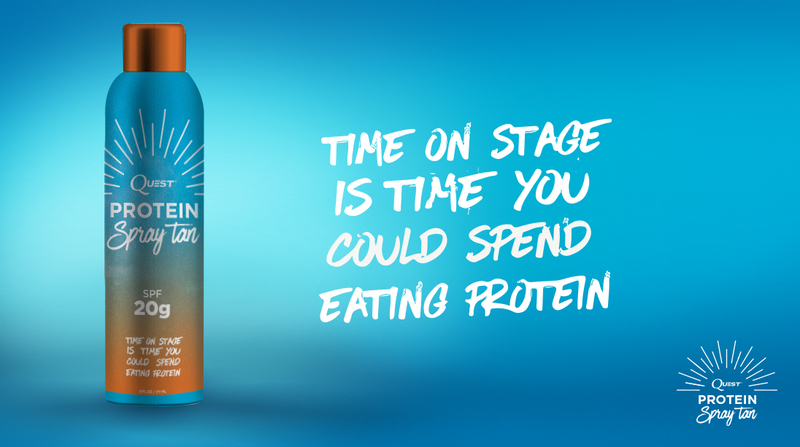 Or, if necessary, just take it as a protein shot." Quest takes a tongue-in-cheek approach to “SPF” with this product, redefining the term as “Spray Protein Factor,” which is the amount of grams the typical user will absorb in one “serving” (or application). The product comes in 20, 50, and 75 SPF. Quest released the product to a few select tanning salons before making the aerosol version available to the general public this morning. Think it’s too good to be true? That's because it is. APRIL FOOLS! This content was supplied by our friends at TheBloq. For more articles like this, CLICK HERE.